.Mining case is designed for building professional crypto-currency mining rigs. 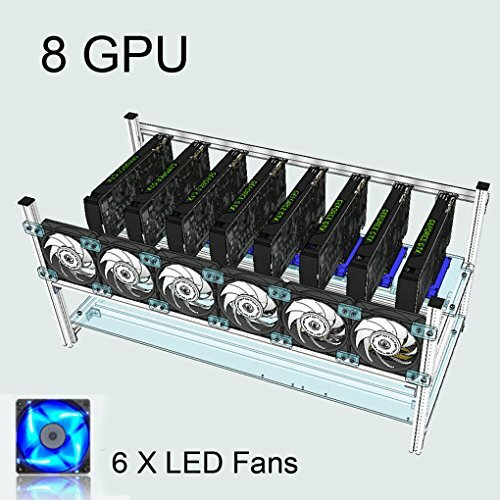 .Name:Aluminum frame for 8GPU mining .Specifications: .Material:Cold rolled steel+Aluminum alloy .Color:Silver/Black .Size:76cm x 36cm x 35cm . .Features: .100% brand new and high quality .One layers shelf with big capacity can place 8 GPU .Feet are height-adjustable, all screws and nuts included, plug and play. .Mining case is designed for building professional crypto-currency mining rigs. .Feet are height-adjustable, all screws and nuts included, plug and play. .Perfect for mounting your mining GPUs next to your existing desktop. .You will receive the frame disassemble,you need to assemble it by yourself,thanks for understanding. The chassis is aluminum structure with acrylic panels, use copper pillars to fixing the motherboard firmly. strong and durable, full protection of graphics cards and electronic devices, can be firmly superimpose. Graphics cards’ installation height can be adjusted, you can adjust the lower cooling space according to the length of the extension cord to improve the machine’s overall cooling effect, easy installation and maintenance. Perfect support single / double power scheme, support the installation and fixation of ATX/MATX type boards,Keep your video cards extra cool with this open air design.